User Centric, a company specializing in reporting on eye tracking movements on web sites and other applications, recently updated their research on the amount of time users looked at specific areas of a search results page on Bing and Google. Their findings? 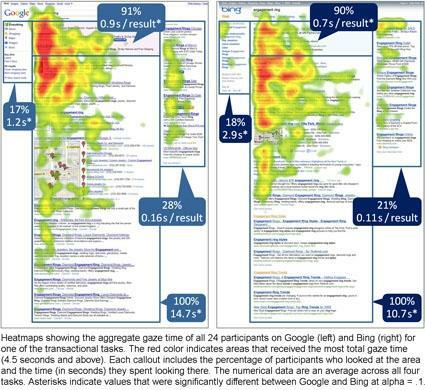 For Google and Bing, over 90% of users glanced at paid search results at the top of the page. 28% glanced at the right column paid search ads on Google. 21% glanced at the right column paid search ads on Bing. This is all great stuff, BUT…what good are those “hot” eyeballs if they’re not attached to the head of the “right” customer? This is especially important when you’re making an investment in paid search. While Search Engine Optimization helps you position your company at the top of organic search results, effective Search Engine Marketing makes sure the eyes that are drawn to those top links are the customers you want. Search Optics offers managed paid search that not only places ads according to your budget and target, but fine-tunes your campaign in near real-time to ensure you get the highest quality traffic and lead volume. We back it up with intelligent reports that show each campaign’s performance so you can ensure you are making the best use of your campaign budget. Coupled with industry leading services in organic search optimization, we ensure that you get the “right” search engine views that drive leads and sales. Want to learn more? Leave us a Comment below! The post Organic Search Engine Optimization And Effective Paid Search Pay Off appeared first on Search Optics Blog.